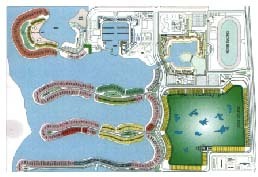 Development of a 210 Hectare marine based recreation city located approximately 40 kms north of Jeddah, Saudi Arabia. The project included 2.5 million cubic meters of dredging to allow sea within the area and backfilling reclamation to introduce sea front land. All shore lines were protected using rock armour and provided with underwater culverts and road bridges to allow water circulation between the "finger" shaped land strips, the artificial island and the existing sea creek. 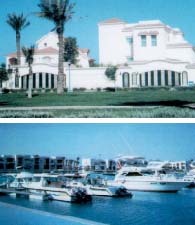 The project comprises three primary zones of development: Residential plots for sale on landfill, a marina to moor 320 yachts of varying sizes and public facilities primarily aimed at day visitors. The entire city is served by a service area comprising power generation, sewage and water treatment plants as well as city wide control, security and maintenance facilities. Master planning, parcellation, architectural and engineering designs, infrastructure and hydraulic designs as well as preparation of tender documents, construction cost estimates and schedules, construction management, and supervision of construction.